The Nürnberg Pop Festival takes place every year since 2011, this year being the 6th event of its kind. The main focus is on music and live shows. Different events take place during one evening throughout different venues around the second biggest city in Bavaria- Nürnberg. This year it took place on the 29th of October, towards the end of the fall season, during a time when walking down the streets of the historic city was crispy cold yet the parks and trees of the city still colored it in all shades of yellow and orange. Another thing noticeable while walking through the city is Hannah Rabenstein’s work, which mainly focuses on typography, hand lettering and calligraphy as graphic design and a form of art. You can recognise her work in many different shops, cafes and bars’ windows and interior walls. In addition to that, during this specific time also on posters all over town promoting the Pop Festival, as she did this year’s branding and design. The collaboration between BMW’s MINI, Montana-Cans markers and Hannah Rabenstein all together created a scene well worth coming to check out, but for those who weren’t there, we made sure to document and fully cover it to create a video that captured the magic for you to enjoy. 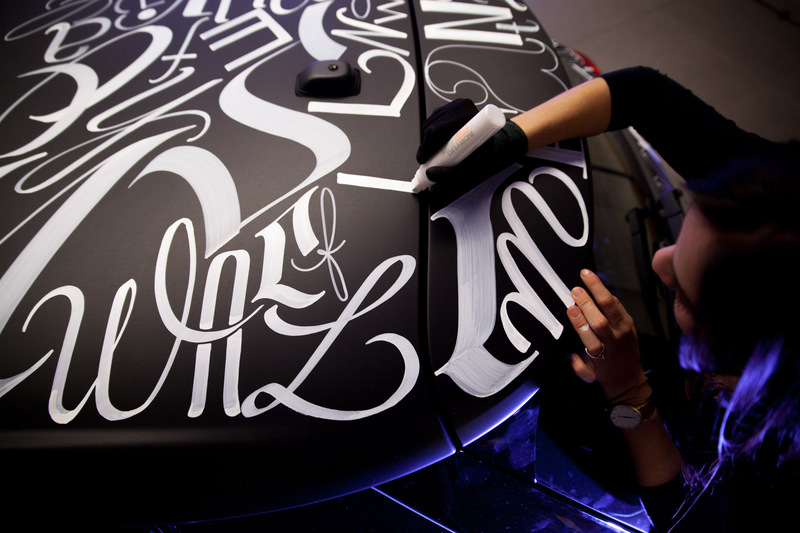 In the video and images you can see Hannah’s “canvas” was a black-matt-coated MINI, on which she painted a wide variety of letters in different types, shapes and sizes. Since painting on such a smooth black surface, she wisely decided to paint all letters in white- except for a few gold exceptions. See all products of Montana ACRYLIC Marker Range here or Follow Montana Markers on Instagram @montanamarkers for instant news! Make sure to check out more of Hannah’s work at www.hannah-rabenstein.tumblr.com or follow her @rabenhannah on instagram.